Voodoo Vibes slot machine is here with great features! Don't be scared of the curses and snakes here the only scary thing is the high winning that you can get while playing Voodoo Vibes online slot machine! As it can be clearly seen, this is a voodoo-themed slot machine. It has a mysterious atmosphere and players can surely feel themselves in the middle of a voodoo ritual. The darkness adds more excitement to the gameplay. In addition, the glowing eyes in the dark makes this slot machine more and more enigmatic. 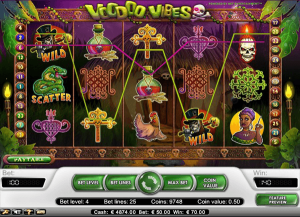 Voodoo Vibes slot machine has 5 reels, 25 lines with probably the best features that a slot machine can have. It's a multiple coin video slot machine with amazing and surprising twists. There is an option to play for fun and with real money. No matter which way you choose, the entertainment for a long time is guaranteed! However, it's more thrilling if you try this slot for real money. It's a very easy way to earn much money. Let's present the symbols that players can see while playing Voodoo Vibes. Land at least 3 of them to get a winning combination. There is a skull candlestick with a very angry look. After, there is a voodoo priestess in tribal clothes with a huge needle. A chicken can be found as well. The essential red-colored magic potion is also here to help you. Other tribal patterns with bright colors can give you good combinations. What's more, Voodoo Vibes slot has a bonus symbol as well. This is the voodoo doll with a short red hair. Land at least 3 to get into the bonus game. The slot has a Wild symbol, too. The man you can see is Baron Samedi and is grinning. It substitutes for all symbols except scatters and the bonus wins. Try to collect as much as you can. This slot includes a Scatter symbol, the green snake. If you have a lucky spin and land at least three Scatters anywhere on the reels, you will get 10 free spins. The prizes will be tripled. During the free spins, ten additional free spins can be won. Just land at least 3 more of the furious snake. For what these symbols are exactly worth, check the paytable where you can find the combinations as well. There is a mini game in Voodoo Vibes slot which you can get into by spinning at least 3 Voodoo dolls. When you enter the bonus minigame, 12 various colored voodoo dolls can be seen on the shelves. You will get a huge pin. In this room, you will see the spider webs, candles and a skull What do you need to do? Stick the pin into the dolls until you find the only one doll which doesn't award you a prize. The best prizes are waiting for you. What are you waiting for? Play with real money for a more exciting game. Try Voodoo Vibes online slot machine now and get extremely high prizes!